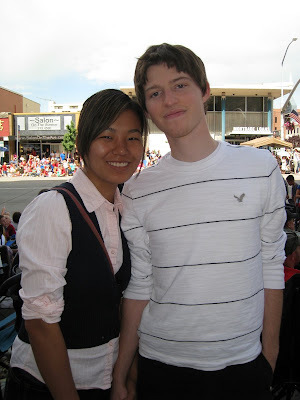 We broke tradition slightly this year and went to the Provo parade on the 4th of July rather than the Murray parade. The floats were throwing tons of candy to the kids as they passed by. Unfortunately, we arrived a bit late and were therefore outside of candy throwing range. So, Larry's brother Jamison took Ava and wormed his way through the masses to get Ava a front row seat and all the candy a kid could possibly want. However, as soon as she got this lollipop she was content to return to the safety of the sidewalk. Larry's brother Danny and (Danny's then girlfriend/now fiancé) Patricia came down from BYU-Idaho to attend the 4th of July festivities. Here's the happy couple practicing for their engagement pictures. Larry's aunt and uncle from Washington D.C. were also in town to help move in their daughter Katrin (Larry's cousin), who is starting her freshman year at Utah Valley University. 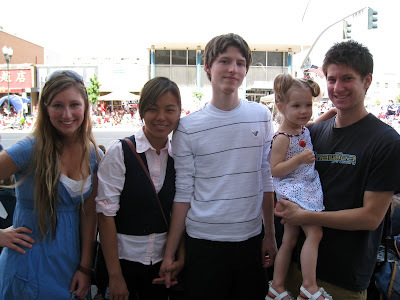 Here's Katrin along with Patricia, Danny, Ava, and Jamison. 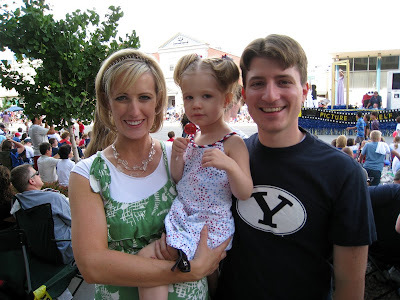 After the parade, we all headed over to the Provo carnival to take Ava on some rides. There were only two rides which Ava was big enough to go on. 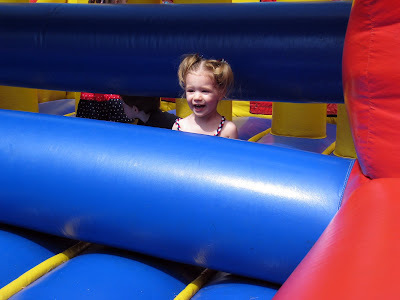 The first was an inflatable obstacle course. Ava was very excited to go on it at first. However, she didn't make it very far before getting stuck. She quickly admitted defeat and asked to get off (it didn't help that the rubbery plastic was very hot to the touch due to the extreme July temperatures). The other ride was a giant inflatable slide. Ava quickly shied away from what looked to be too scary of a height for her liking, thus forfeiting her tickets to Danny and Patricia and reclaiming her lollipop. Later that night, we hosted the annual 4th of July party, which is now permanently held at our house due to the fact that our backyard provides an excellent view of the Thanksgiving Point fireworks.